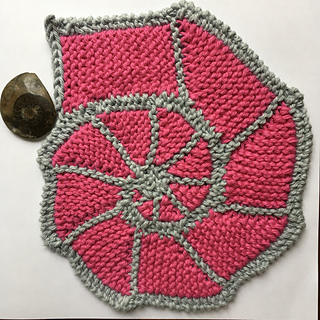 The designer, Susanne or Sybilra on ravelry, is using short rows and intarsia to come up with the image of a lovely Ammonite. Right off I could see that quite a bit of math was used here and this is what Sybilra said in a pm " Ja, diese Anleitung ist mathematisch/algorithmisch. Ich war kurz davor, die Anleitung auch noch in einer Art Programmiersprache (“Pseudo-Code”) zu schreiben - habe es aber dann doch nicht getan, weil es eher verwirrt … "
Translation: " Yes, the instruction is very mathematical/ algorism. 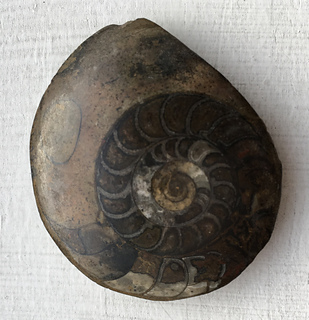 I intended to write the instructions in a sort of program code (pseudo-Code)- but didn't in the end, because it would have been too confusing.."
Not to worry, her patterns and blog are mostly in English. 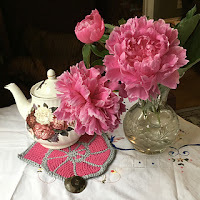 She has a blog " Knitting and so on" which I checked out and which is a treasure trove of unusual designs; and except for a few they are free! They go from potholders to fingerless mitts to sweaters. You can get lost checking out everything and from what I can tell, the patterns are written out clearly and easy to follow. One bonus to me: She lives not far from my hometown, Duesseldorf in Germany. Next time I go over there, we may just get together for a cup of coffee and some knitting. When I was given the opportunity to be one of the judges in a panel of three to review the presentation given by Lula, a senior at Woodstock Day School , I jumped at the chance and I am so glad that I did. Lula's senior project was all but not only about knitting. For everyone’s benefit, let me rehash a little about her project. 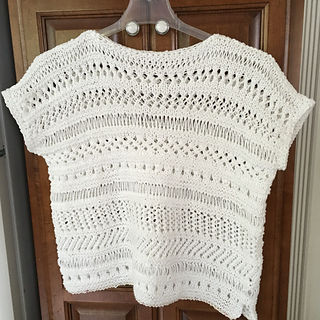 Because Lula feels passionate about knitting, she wanted her project to have to do with knitting. And knitting she did, she even started a knitting club and got other students and teachers involved and was allowed to knit during class. The last fact had the added benefit to her own focus to better absorb class material ( check out “ Health Benefits” on my bog). 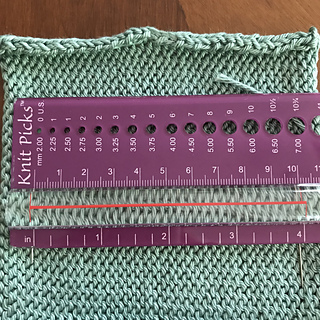 She calculated how many squares/ rectangles she needed to get done each day to finish in time and quickly realized that she needed to make this into a campaign, even offering to teach knitting to those non-knitters who wanted to come aboard. 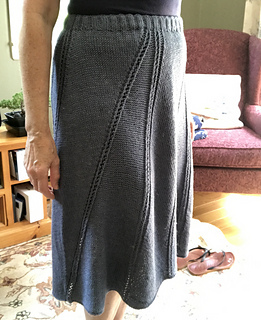 Lula learned so much about the different Yarns and stitches and how to collaborate such a huge undertaking. At the end of the presentation which was about 1/2 hour long, I was thoroughly impressed not only by the project itself, but also by the young woman who saw it all through. I am glad that in the end not all of the squares were used for the blankets for Warm up America. I hope that she can make a blanket for herself out of those left over knitted squares. A blanket to keep and to warm her with memories of her journey back when she was a senior at Woodstock Day School. I wish her much joy and success in the next chapter of her life which is college as well as with all future endeavors. 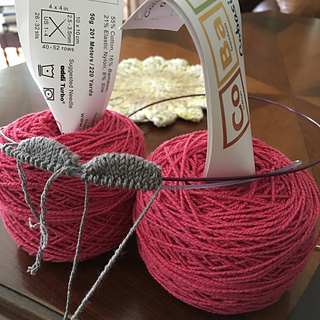 It inspires me so to see the younger generation discover a passion for the hand crafts and especially knitting and then even turn it around and use that to give to others in need. Well done, Lula!